AJM is suitable for machining heat sensitive material like silicon, gallium because the heat generation during the machining is very low. Ajm can be used for cleaning purposes. Removal of oxides on metal, smears on ceramics, and other resistive coating on work material (e.g., insulator stripping and cleaning of wire). For removal of parting lines from injection moulded parts. AJM is useful in deburring of plastic, cutting of metallic foils, machining of super alloys and refractory materials. They are used for machining of thin, brittle, fragile materials like germanium because of low overall force. To engraving permanent mark on the material. Deburring of small precision parts that required a burr free finish such as medical appliances, hydraulic valves, aircraft fuel system. Micro grit blasting, Trimming and bevelling. It is the best method for deburring small milled slots in hard metallic components, small hole like in hypodermic needles and cavities inaccessible by other means. Polishing of nylon and Teflon components. The process is free from chatter and vibration as there is no contact between the tool (nozzle) and work material. Do not cause hardening of workpiece material. Very little or no heat generation during the cutting process, so it is suited for machining of heat sensitive material. High surface finish can be obtained by choosing a suitable abrasive material with a size that is suitable for the requirement. In case of damage, the depth of damage is very small (less than 3 microns). Thin sections of brittle and hard material like ceramic, glass, and germanium can be machined. It can be used for drill holes of intricate shape. It is used for machining cavities which are inaccessible by other methods. Low capital cost and ease of operation. The material removal rate is low. The process tends to environmental pollution. A dust collection system must be provided to avoid air pollution and health hazards. This can be eliminated by using abrasive water jet machining. The abrasive powder cannot be reused because its cutting ability decrease and it may clog on orifice of the nozzle. Higher chance of stray cutting. Tapering may occur during drilling. 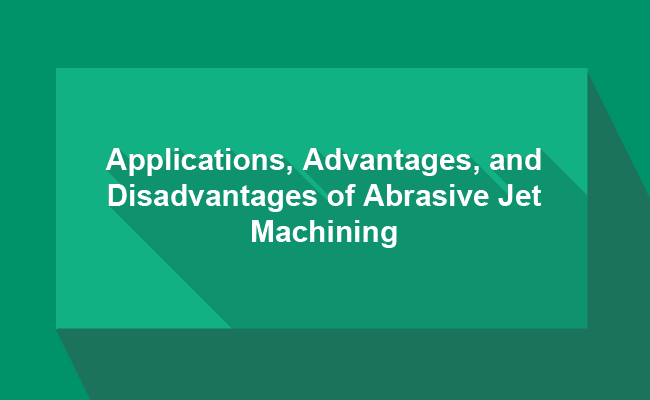 AJM not suited for machining of soft material because the abrasive may get embedded in the work material. Nozzle life is low (300hr), and short standoff distance causes frequent damages on the nozzle. The air used for abrasive jet must be moister and oil free.